Fourier Transform Infrared Spectroscopy (FTIR) is a technique used to obtain an infrared spectrum of absorption, emission, photoconductivity or Raman scattering of a solid, liquid or gas. An FTIR spectrometer simultaneously collects high spectral resolution data over a wide spectral range. This confers a significant advantage over a dispersive spectrometer which measures intensity over a narrow range of wavelengths at a time. 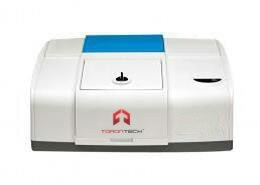 FTIR-TT 650 is a single beam FTIR spectrometer. This instrument is operated by a PC. It is a powerful tool to analyze the sample structure in many fields such as petroleum, chemical engineering and pharmaceutical Industry. The main body of the machine is made of cast Aluminum which makes a robust bench top optical testing machine. It is highly stable and there is no need to adjust, trouble shoot or maintain optical path.